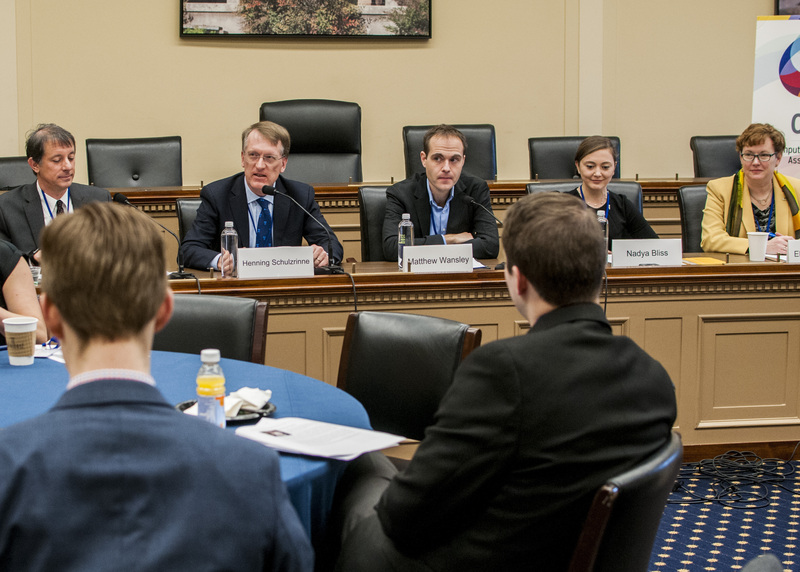 From left to right: Dan Lopresti, Henning Schulzrinne, Matt Wansley, Nadya Bliss, Elizabeth Mynatt participate in a congressional briefing on Intelligent Infrastructure Research. 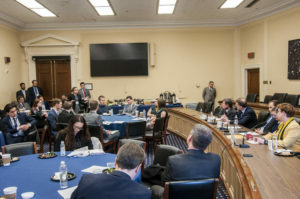 On a day when President Donald J. Trump is expected to use his State of the Union address to unveil his administration’s plans for nationwide infrastructure investment, a panel representing computing researchers in academia and industry told a group of congressional staffers and other stakeholders that while those infrastructure needs are critical, it would be shortsighted to simply replicate more of what we have. Instead, they urged, now we have an opportunity to invest in the research and make progress on the policies that would allow for an “intelligent infrastructure” that would provide a foundation for increased safety and resilience, improved efficiencies and civic services, and broader economic opportunities and job growth. The panel — led by moderator Dan Lopresti, Chair of the Department of Computer Science at Lehigh University, along with Henning Schulzrinne of Columbia (and former CTO of the Federal Communication Commission); Matt Wansley, General Counsel for nuTonomy, a startup focused on autonomous vehicle technologies; Nadya Bliss, the Director of the Global Security Institute at Arizona State; and Beth Mynatt, Director of the Institute for People and Technology at Georgia Tech — highlighted the promise of the technologies that will enable more intelligent infrastructures, but also noted critical gaps and barriers to successful deployments. 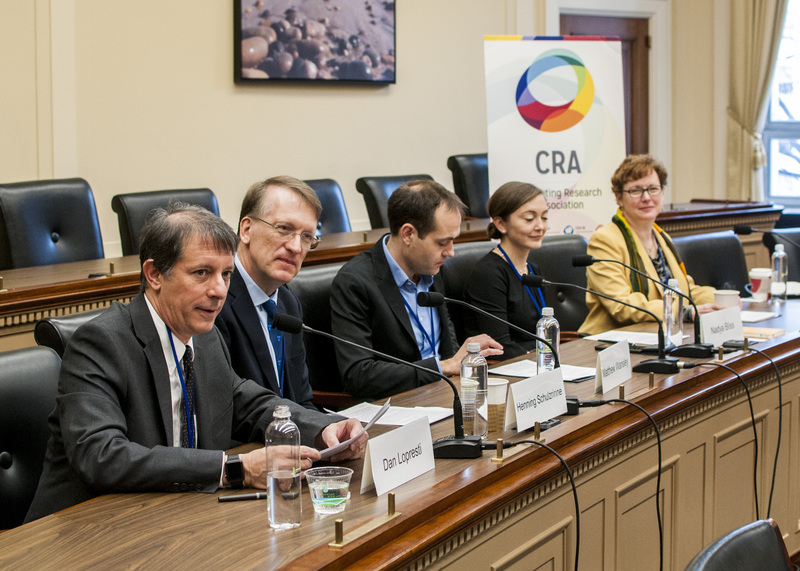 The briefing was sponsored by CRA, along with honorary co-hosts Rep. Lamar Smith (R-TX), Chair of the House Science, Space and Technology Committee, and Rep. Eddie Bernice Johnson (D-TX), Ranking Member of the House Science, Space and Technology Committee. Henning Schulzrinne, of Columbia University, addresses the attendees of the Capitol Hill briefing. Intelligent infrastructure is the deep embedding of sensing, computing, and communications capabilities into traditional urban and rural physical infrastructures such as roads, buildings, bridges, pipelines, water and electric distribution systems for the purpose of increasing efficiency, resiliency, and safety. Intelligent infrastructure has a wide range of applications, including transportation, energy management, public safety and security, disaster response, agriculture, and health. Matt Wansley, of the company nuTonomy, addressed issues of robustness and interoperability. 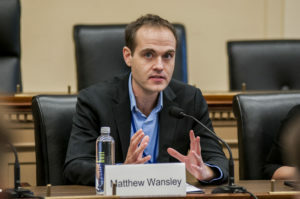 Wansley added an industry perspective to the discussion, noting the importance of solving problems of robustness and interoperability to successful deployments of vehicle-to-infrastructure (V2I) communications that would add tremendous value to communities with autonomous vehicles. V2I would not only enable autonomous cars to pull information from the existing infrastructure — the color of the traffic signal, the state of traffic ahead, the extent of construction zones on the route — but also push it back into the infrastructure for the benefit of all users. “Intelligent infrastructure is a textbook example of a positive externality,” he said. But getting there will require that the companies developing autonomous vehicles, and the consumers who ride in them, must be able to rely on the infrastructure — and that will require more fundamental work in the understanding how to build in robustness and interoperability in these system. This is work that’s perhaps best suited to university-led research fueled by Federal investment, he noted, as there are not sufficient market incentives for large corporations to make such V2I networks open and usable widely. 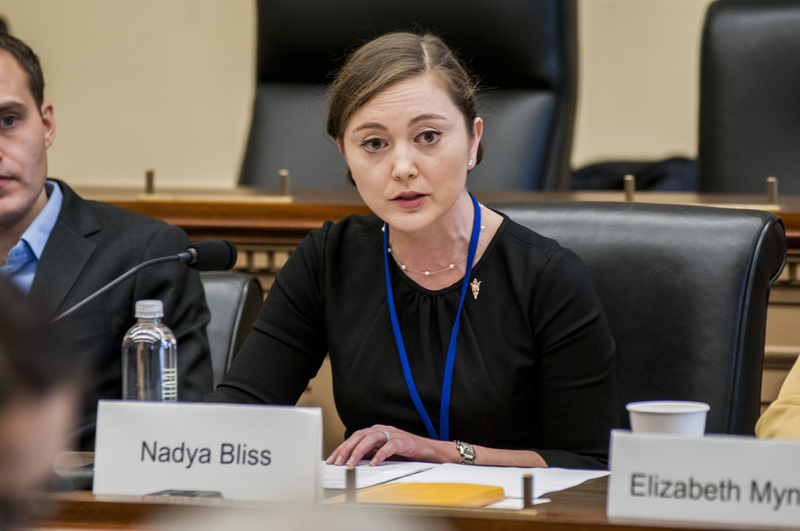 Nadya Bliss, of Arizona State University, addressed issues of security and trustworthiness. 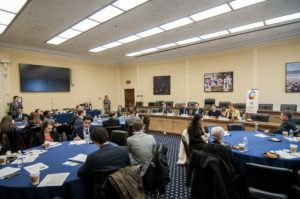 In addition to forward looking data platforms and policies to spur open innovation, Mynatt also discussed two other gaps that stand to prevent communities from reaping the economic rewards of infrastructure investments: productive access to broadband capabilities and innovating systems for effective training and job creation. She noted that broadband access in rural communities is often constrained by last mile problems, which might be met by combining wired and wireless connectivity. Similarly, meeting the needs of rural agriculture might require “flipping the cloud”, recognizing that agricultural users are not simply consumers of content, but potentially generate large volumes of data about their own farms, which might best be addressed by having more computation available to them on the “edges” of the internet nearest them, rather than pushed back up to some central cloud through a constrained pipe. These challenges also highlight the need to have a workforce trained to work with (and on) these new infrastructures. Elizabeth Mynatt, of Georgia Tech, addresses the attendees of the Capitol Hill briefing. An attendee of the Congressional briefing poses a question to the panel. The briefing was well-attended and generated good discussion both in the question and answer period and in follow-up conversations with congressional staff. We’ll keep you apprised of developments as the Administration’s infrastructure proposal begins its march through the legislative process. 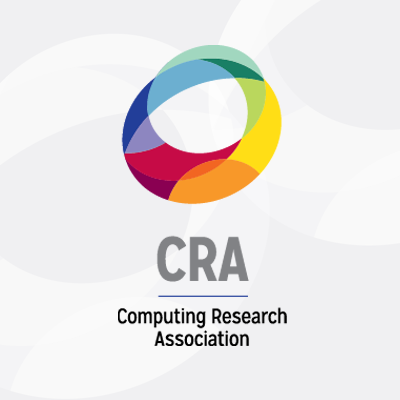 In the meantime, you can read the “one-pager” from the briefing, or check out some additional resources, including white papers produced by the computing community on various aspects of intelligent infrastructure research.